Mix the crumbled crackers, parmesan cheese and seasoned salt together in a gallon ziplock bag. Pour it into a large flat bowl or other container. Put the sour cream in a flat bowl or plate. Here is your assembly line. 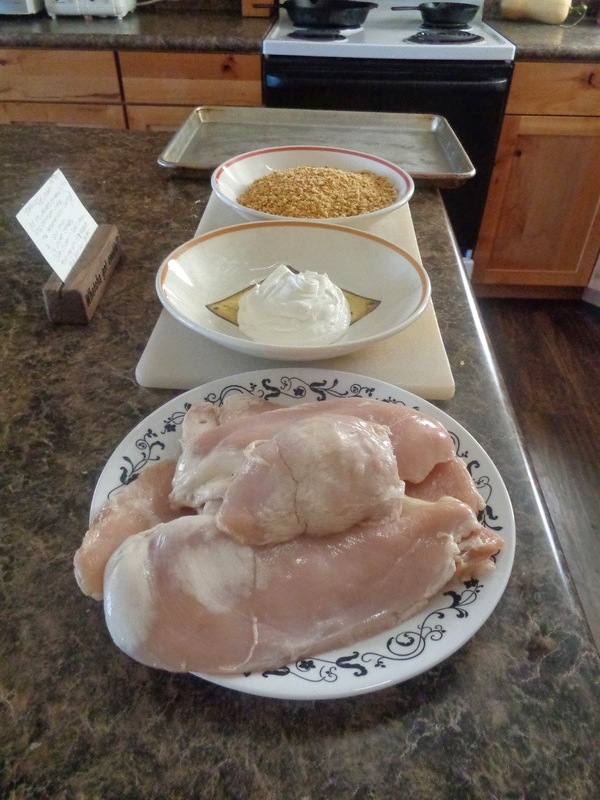 Dip the chicken in the sour cream. (I have discovered that most sour creams have all sorts of additives, Daisy does not. More expensive-yes, more healthy-YES.) Then coat it in the cracker crumb mixture and place it on your baking sheet. You can also bake it in a cake pan. Put little pieces of cold butter on top of each chicken. Bake in the oven at 350 F for 30-45 minutes depending on the thickness of your chicken. Sometimes I cheat and do 400 F for 20-30 minutes. Onto the zucchini casserole. Easy, easy, easy. Here's what you need: A small zucchini that doesn't have big seeds. Tomatoes, onion, cheese, bacon, and some shredded cheese. Oh don't forget the salt and pepper. I spray the pan with nonstick spray just incase. I made a small pan today because my kids aren't crazy about it... yet. Spray pan with nonstick cooking oil and place zucchini in half inches slices at the bottom, like so. Add salt and pepper. Do the exact same thing with the tomatoes. Slices, salt and pepper. Dice them up, throw them in a pot with some salt and boil away, for 10 minutes or so. I choose to mash mine up with butter and more salt. I'm starting to wonder if my kids don't like the idea of orange mashed stuff though... They may eat it better if it's just in cubes with butter and salt. Either way, yummy buttery squash is awesome! The zucchini casserole has wonderful flavor as the bacon and onion drippings flavor everything below them. The chicken is tender, with a crispy coating. Easy meal when planned ahead, and most of it straight from the garden. A friend once said that when you grow your own food it's like printing your own money!